This is a guest post by Sustainable PF. Nothing reminds Canadians of jovial summer moments like the smell of a camp fire, the ­sound of a loon call, a cool beverage on a deck at sunset or the crisp shock when diving into a lake in May like the time spent at the family cottage. Whether you call it a cottage, camp or cabin the use and enjoyment of a recreational property has become a part of Canadian culture. Cottages are a treasured retreat for families where priceless memories are formed. To ensure future generations share similar memories the Canadian cottage owner must plan ahead before transferring ownership of their treasured property to their children because a capital gain tax will apply on the transfer of recreational properties and this tax can be significant. There a number of strategies that a cottage owner can undertake to deal with and potentially avoid the capital gain tax. Each cottage owner will have varying circumstances that will influence the decision and plan they ultimately adopt. Before taking any action the recreational property owner must understand what a capital gain is and how a capital gain is taxed. The first step you need to take as an owner of recreational property is to ensure you have left the property to your spouse (if applicable) and/or children in your will. This means the tax bill will be deferred until your spouse and/or children sells the property or passes it on when he or she dies. The next thing you need to do is become fully versed in how the capital gain tax will affect you. The taxes levied will be $365,000 – ($33,000 + $56,000) = $276,000. Tax is payable on half of this amount: $138,000 at a 40% marginal rate would result in tax owing of $ $55,200. This tax will have to come from either the estate or the children who inherit the property. This is a large tax bill for anyone to pay and could well force a difficult decision to sell the beloved family cottage simply to cover the tax bill. Now, you may be asking “what about that capital gain tax exemption I heard about?” Long gone, as in 17 years expired. If you didn’t use the $100,000 capital gains exemption in the mid 1990s you can’t use it retroactively. The Canada Revenue Agency (CRA) has pretty much plugged every loophole when it comes to recreational property and capital gain taxes. Like it or not, the kids (or anyone) inheriting the family cottage is going to pay taxes. They will likely have to pay a land transfer tax unless the property is in Alberta or Saskatchewan but even then there is a small transfer fee. One may think that selling the property at a nominal price would be a good idea to keep land transfer taxes low but there is a downside to doing this for the kids inheriting the cottage. In addition to land transfer taxes Canadians, aside from those who reside in Quebec, will have to pay a tax or fee on the value of the assets that are part of the deceased’s estate. Again, Alberta seems to pay the least ($400) while citizens in British Columbia may pay up to $50,000 probate tax based on a sliding scale. Ouch! I mentioned that parents may want to sell the cottage to their kids at token or minimal price to reduce land transfer taxes. Perhaps the idea of leaving the cottage as a gift is appealing. While the initial tax hit will be less transferring the property but the capital gain will still be calculated based on what the federal government deems the fair market value of the property to be. Additionally, when the kids pass on the property to their kids or try to sell the property they will pay capital gain tax based on the sale price they once benefited from. This ends up adding up to essentially a double tax for the government and your family net worth will be much less. It is cheaper to pay land transfer tax than a capital gain so fudging the sale price doesn’t make a lot of sense for you or your kin. You can also decide to sell the cottage to your children, and if you do you should consider taking back a mortgage. Taking back a mortgage occurs when you, the vendor, personally offer the purchaser (your kid(s)) a mortgage loan as part payment for the purchase price. The CRA lets you pay back the capital gain tax over five year maximum. The key here is that in your will you forgive the mortgage and your kids will own the cottage sans debt or taxes to pay. In some cases it may be advisable to consider making your cottage your principal residence. If your cottage has gone up in value more so than has your home, you may want to designate your cottage as your principal residence. Canadian adults (single or married) are allowed one principal residence and the benefit here is that when your principal residence is sold or ownership is transferred, there is no capital gain taxation. You do however have to live at your principal residence for a reasonable portion of the calendar year. For example, a family in Peterborough Ontario after buying a home in the mid 1970s may discover that it has increased in value by $200,000 but the recreational property they bought in the Kawarthas at the same time may have increased in value by close to $1 million. The difference in the capital gain upon transfer of ownership would be huge if the cottage was not declared the principal residence. Another strategy is to purchase life insurance for the value of what you determine the capital gain will be. The life insurance pays out when you pass and can be used to pay the capital gain tax. The issues here are that you don’t know precisely when you will die so this is a potentially long term expense. Additionally you can not predict what the cottage will be worth on an undetermined future date nor can you predict which additional improvements may be made to the property during your lifetime. Since 2000 it has been possible to transfer the cottage into what is called an “alter ego” trust. Establishing a trust involves legal expertise so it is wise to consult a professional to set up the trust. The minimum age to establish an alter ego trust is sixty-five years of age. The owner of the cottage property transfers it into the special trust but does not trigger the capital gains tax. The creator of the trust (the trustee) maintains control and use of the recreational property. The children are added as beneficiaries of the alter ego trust and are also able to use the property and will inherit it on the death of the creator of the alter ego trust. Capital gains tax will calculated on the date of death of the creator of the trust. Since the cottage is in trust it will not fall under probate tax as well as it is not part of your will. There are numerous ways to try to manage the capital gain tax upon the assignment, sale or transfer of a recreational property. Some are more complex than others. Have you sold a cottage? How did you deal with the capital gain? About the Author: The author, along with his wife, created the blog SustainablePersonalFinance.com where they discuss and explore balancing their personal finances with sustainable living. You can follow them on Twitter @SustainablePF, like them on Facebook and subscribe to their RSS feed if you enjoy their content. Problem now is that those cotteges are wayyy to expensive. If you are a cottage owner, I assume it was bought in the family many years ago, or you are wealthy with high income, or in debt with a mortgage. But I would love one, just not at those prices. Much easier and cheper to rent. Does anyone know the popular cottage areas in Ontario? What are the average prices? @jungle – agreed. 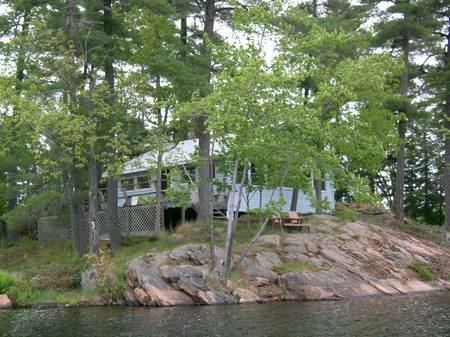 The image in this post is actually our cottage but it is on an island which devalues the price. It has been assessed @ less than $150k believe it or not (3 cottages on the island on a small lake). It is not winterized and their is electricity, and a pump in the lake for water – but no phone or internet or TV. No access while the water is semi-frozen. Our cottage is about 40 mins north of Kingston (on the lake beside the provincial park). It was bought in 87 for about $15k I think. So the price isn’t THAT extravagant. We could buy it (if it was for sale) given we don’t live in the GTA and COULD take on much more mortgage (not that we want to). I also think the assessment is off – the structures (cottage, bunkhouse, shower/storage and outhouse) are in great shape. The dock is solid. Our 1/2 acre of nature bliss. @FT – one area is where we’re at – Frontenac. A lot of cottages are in the 250k-1mil range – ones that are basically HOUSES on lakes. Obviously we have a cabin not a house. Rustic. Other areas are the Kawarthas – again, pricey depending on the amount of land and the style of house. Also the Muskokas (north of where we live – Peterborugh), north of the GTA which are insanely priced – even just for the land. Our family has a cottage that we bought as a family (parents, brother & I)…although we put it in our parents name figuring we are going to inherit anyways…we did not think about the future taxes. This is what we have done and my accountant says it’s all good, should be no problems. First, my dad passed away in 2008. My mother did not want to stay in the house. She sold the house and used the proceeds to pay the mortgage of the cottage off. All she wanted was a small apartment for herself so she rents that. So she “lives” at the cottage all through the good weather and rents in the winter. The cottage has become her principal residence as the CRA looks mainly as how many properties you own when you die….so since the cottage is now her principal (and only property) residence there will not be capitol gains taxes to my brother and I when we inherit it down the line….at least that’s how I’ve seen it. Correct me if I’m wrong or not detailed enough……thoughts?? @joesnapple Interesting scenario. I am not an accountant or financial advisory by trade and did not come across this scenario while researching. It is best to consult a professional on this, however, on the surface this option appears viable. How about adding your kids to the property title and/or the mortgage itself? Would that not reduce the probate fees since any partial owners would inherit the parts (and only pay capital gains on those) transferred from the passing family member? When you add your kids the property is considered gifted and that incurs a capital gain. @joesnapple I’m fairly sure that if you consult a professional, you’ll be told that some capital gains will have to be paid when you inherit the cottage. Since the cottage was not an income-producing property, it probably did not trigger a change-in-use deemed disposition when your mother began designating it as her principal residence. If you read the CRA bulletin below, it explains that calculating the capital gains involves multiplying the gain by the ratio of years as principal residence to total years owned (jointly or otherwise). Thanks for linking to that cra specification. Beyond my knowledge. I wonder though, if you were to have both an owned home, and then transfer the principal residence to your cottage – would this not be affected by the rest of the rules you cited? Wow, this whole thing is very complicated indeed and I’m still not sure I would be able to pick the best way to go about it even after reading this article. I guess that’s what accountants are for! My father owns a cottage jointly with a friend of his along with a summer house as well. I’m sure he has thought about this before, but I should ask him about it as I will probably at least partially inherit it someday. I guess he would have gone through it with his parents as well because he inherited it from them. My parents have looked into buying a cottage but they are really expensive in areas near us. Lake of the Woods, only a couple hours away can rack you over 1 million in purchasing a cottage. I don’t think cottage life will work for where we are but thank you for clearing up the process. Again, I am no expert in this….just asked my accountant. If my mother passed away soon…there would be some questions I’m sure. But say she lives another 10 years, then from what I am told,they won’t even question it as her principal residence for so long. In addition, since I can prove that I paid into the mortgage and taxes and improvements, etc….I should be able to just inherit and go right?? In fact, I have all the bills and taxes in my name right now and has been since 2008. So even though I am not on the “deed” I can prove % ownership given my scenario of how we bought it…and right of survivor-ship no?? It’s a good advice for the recreation property owners of Canada. Avoiding the capital gain tax can save a lot of money. Thanks for mentioning this in such a detail. My cottage has a higher capital gain than my home at this point in time. If I sell my cottage, can I claim it as my “principle” residence. I understand that in the future when and If I sell my home I would be subject to capital gains on it. The idea of “Sell and Take back a Mortgage” is an inviting one. The vendor being the older generation could take back a very generous mortgage at 0.5% and the balance of the mortgage is forgiven in the will. One better than this may be the Promissory Note point of sale. The parent sells an offspring a cottage for a promissory note made for 15 years in the future. The promissory note is forgiven in the will. Any opinions on this transaction? I researched the promissory note, as did my Dad (who owns the cottage) but I couldn’t find anything that discussed this strategy. Time to see a lawyer I think. You can declare the cottage as the principle residence, I believe, as long as you spend 1 (perhaps 2) weeks at it every year. I’m sure the CRA has criteria to determine things, but I haven’t read about many who spend the obligatory time at the cottage, for it to qualify as a primary residence, encounter a lot of issues. There are rules, Google it (I wrote this post a long time ago so pls forgive me as I do not recall). Play by the rules and i’m confident you’ll be OK.
Another good question. I’ll try to learn more about joint tenancy and post back here when I figure it out. Did your accountant get back to you on this? Would like to know how they responded. That if you’ve been paying the bills for 3 years that has to have some clout. Talk with a financial planner. I’ve gone through this with a few of my clients and tax planning is extremely important. In many cases families try to gift the cottage to their children and pay the capital gains tax today. The issue then becomes ownership and rights to use the property going forward. If there are many parties involved and there is a breakdown in the family, it can become quite nasty and the original owners may lose their property. A life insurance policy to cover the estimated gain is a great investment and will make the transition smooth when the estate is passed on to the next generation. It essentially locks in the fair market value at death, as well, so the next generation reduces any future capital gains they must pay if they decide to sell the property in the future. I am not sure if simply leaving a recreational property to your kids in your will defers Cap Gains until they dispose of it – as is stated in this post. My understanding from drawing up my will is that the cottage is “deemed disposed” unless the named beneficiary of the cottage is your spouse. Cap Gains is then assessed. Joint Tenancy of course will defer the capital gains. Best to talk to a family lawyer (before the tax pro or financial planner) before you make a decision in this area.